Although this salad doesn’t highlight local ingredients (for those of us in the northeast), it is a great way to beat the winter blues. 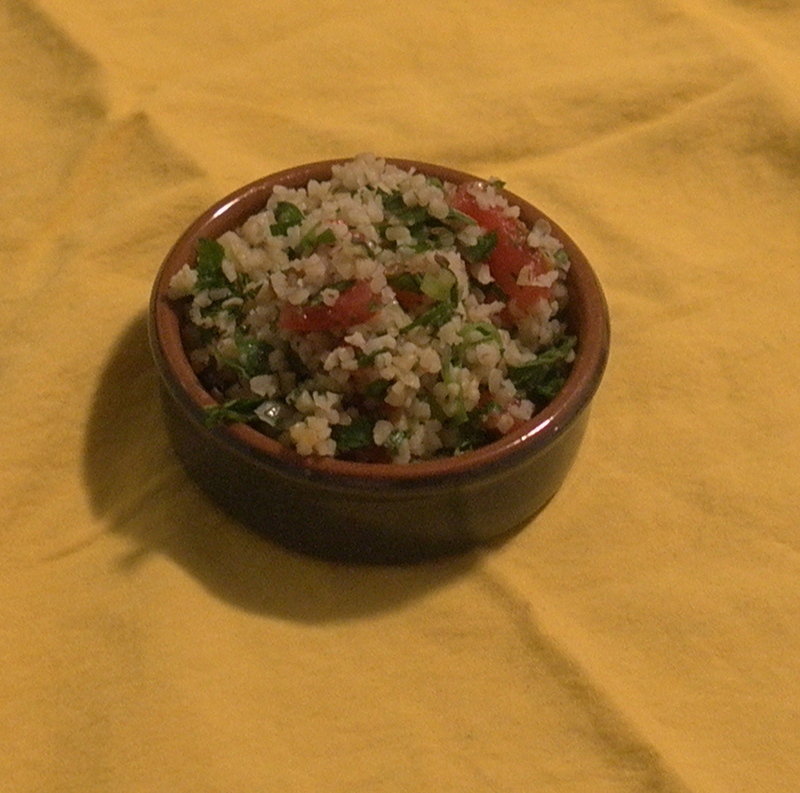 To turn it into a meal, try adding some chopped avocado and putting it over a bed of farro. Happy New Year everyone! Guest blogger day! My mom sent me this beautiful and tasty-looking recipe. One thing that I like about this recipe is that it doesn’t include a ton dried spices, so you won’t find yourself running to 12 different stores trying to find 1 teaspoon of some random spice that you will never use agin. She said that this recipe filled a quart sized mason jar perfectly. Pour vinegar and water into saucepan. Add salt, sugar and lemon peel. bring to boil, stirring to dissolve sugar and salt. Remove from heat. Let cool 20 minutes. 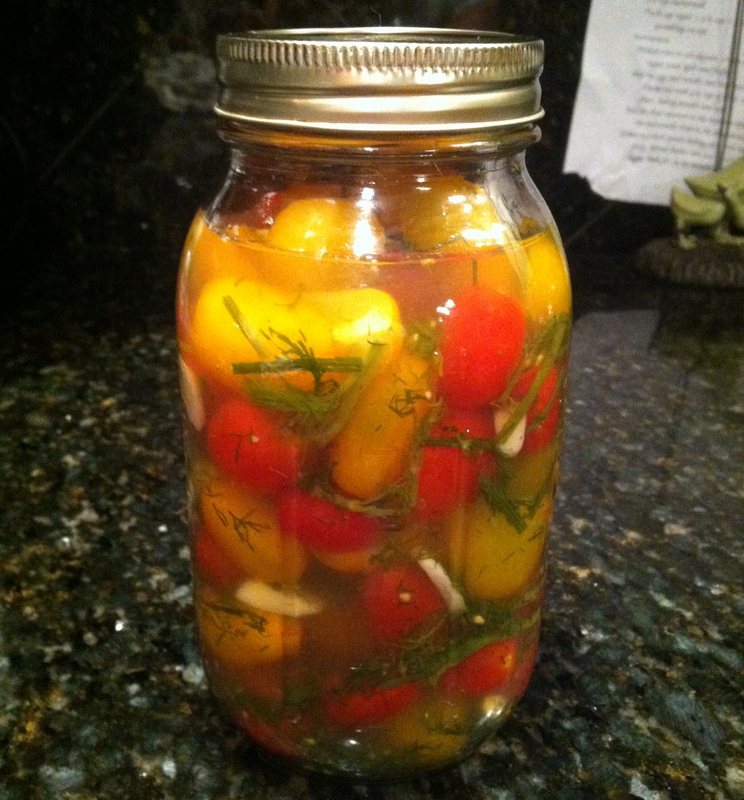 Toss tomatoes with dill, garlic, and crushed red pepper in large bowl. Let stand at room temp at least 2 and up to 8 hours. These can stay in fridge about 2 weeks. When making this salad, I thought it was going to be really weird. Then, I couldn’t stop eating it. The combination of spicy and sweet is definitely addicting, so watch out. Sweet Corn Charlie had arava, which looks like a cantaloupe from the outside and a honeydew from the inside. It is as sweet as candy, with none of the HFCS. I also used cantaloupe. However, you can use any melon you want. The original recipe called for blackberries, but those were not an option at the farmstand , so I used raspberries. The original recipe is from Food and Wine magazine. In a small bowl, combine the olive oil, lemon juice, shallot, and crushed red pepper and season with salt and pepper. Arrange the melon and raspberries on a platter. 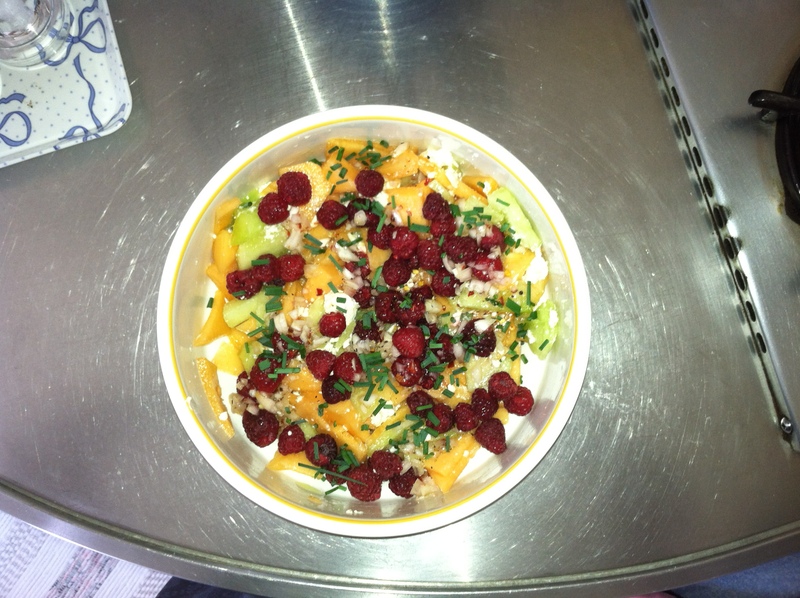 Drizzle the dressing over the fruit. Garnish the salad with the feta and snipped chives and serve. 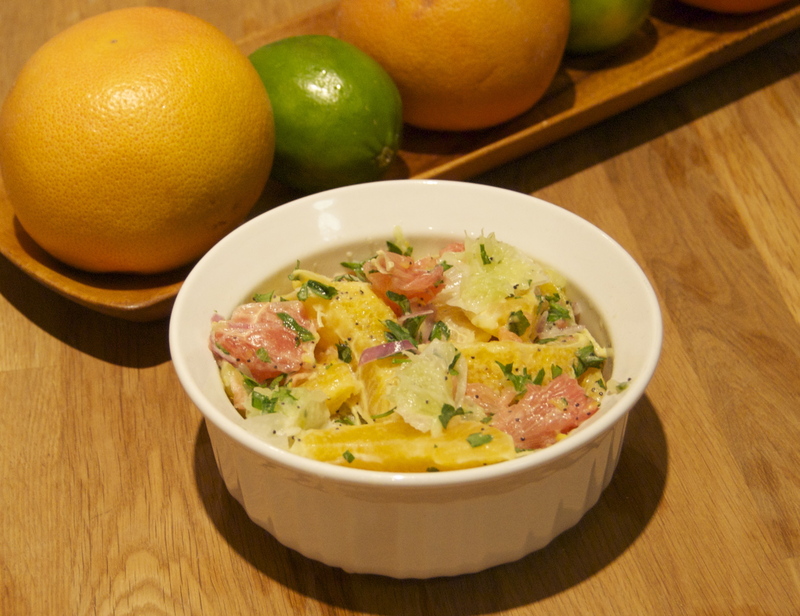 Thanks to Local Roots NYC CSA for posting this recipe from Kitchn. Here is my adapted version of it. Clearly, I’m on a lemon yogurt kick. I made the farro a day in advance to cut the prep time tonight. With that prep out of the way, the salad took me about 15 minutes to make. 1. Soak the farro in water for 30 minutes. Then, rinse and strain. Bring farro, 2 cups water, and salt to a boil. Then, reduce heat to a simmer, cover, and cook until water is absorbed and farro seems to be a good consistency. (I just keep tasting it to see if it is the right chewiness for me, which last night was about 30 minutes). Then, spread the grains out on a rimmed baking sheet and allow to dry for an hour or so, stirring once or twice so the grains dry all around. You can store the farro overnight in an airtight container. 2. Prepare a small bowl of ice water. Boil water in a small pot, and add peas. After 30 seconds, remove peas with a slotted spoon and immerse in cold water to stop the cooking process. Drain peas. 3. Slice leeks in half lengthwise, and then chop into 1/2 inch pieces. Saute leeks in 1 tablespoon of olive oil until soft. 4. Prepare dressing in a large bowl: whisk yogurt, remaining olive oil, lemon juice, and a some freshly ground black pepper. 5. 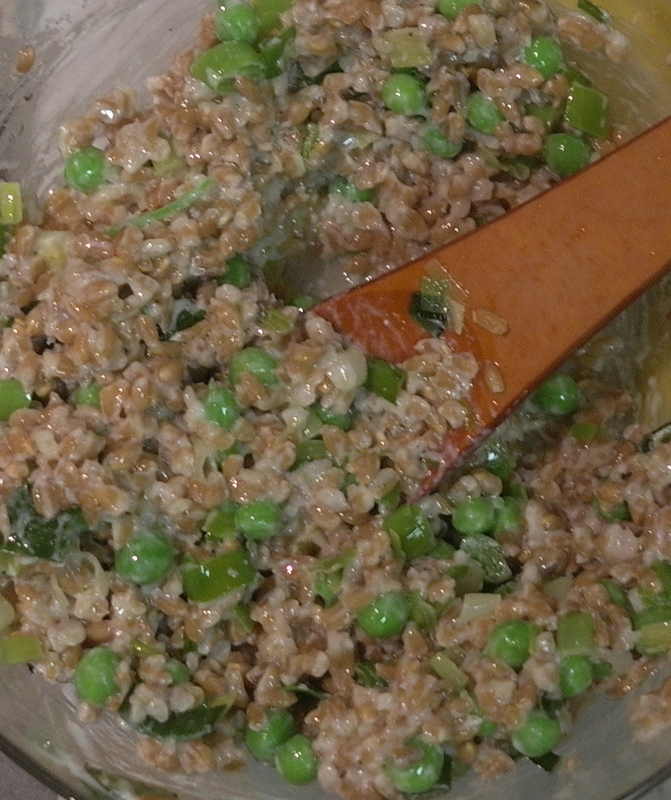 Add farro, peas, and leeks to the dressing, and stir to coat. Enjoy! Last week, Fishkill Farms was offering pasture-raised lamb at the Carroll Gardens Farmers Market. As relatively novice meat eaters, we were unsure what to order. We went with the lamb sausage. 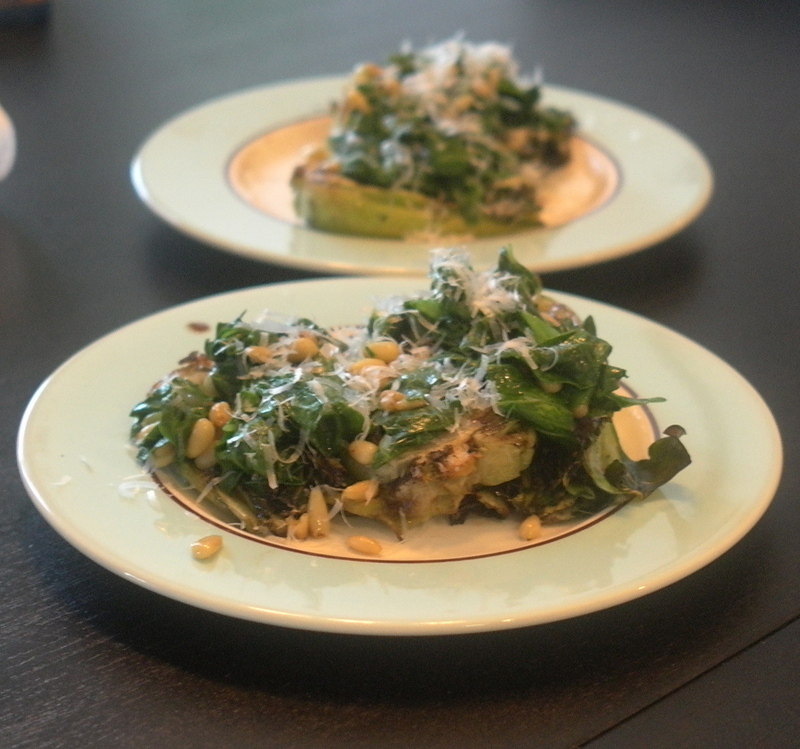 We picked it up this morning, and made this salad this evening. I got the recipe from the Whole Foods app, and it’s spicy and delicious! 1. Heat 1 tablespoon of the olive oil in a medium saucepan over medium heat. Add couscous and cook, stirring frequently, until toasted, about 5 minutes. Stir in water and salt and bring to a simmer. Cover and simmer until water is absorbed and couscous is just tender, 10 to 12 minutes. 2. While couscous cooks, whisk together lemon zest, juice, remaining 1/2 cup olive oil, garlic and salt and pepper to taste. Remove 2 tablespoons dressing and set aside for basting. 3. Preheat a grill to medium-high heat. Grill sausages and peppers, basting with the reserved 2 tablespoons dressing and turning frequently. When sausage is cooked through and peppers are tender, 10 to 15 minutes, remove from grill. Slice sausage into 1/2-inch-thick rounds and peppers into bite-size pieces. 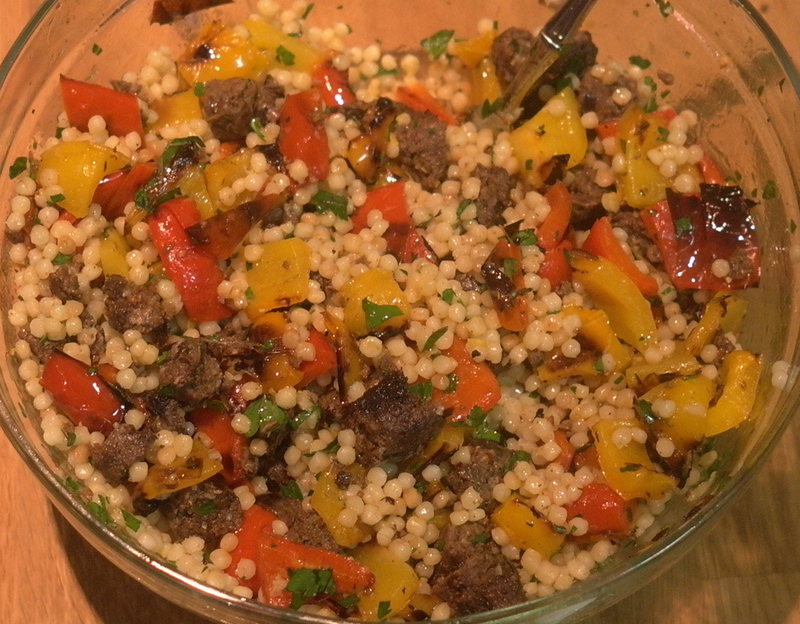 Put in a bowl with couscous. Toss with olive oil-lemon dressing and parsley. Taste and adjust seasoning. Serve warm or at room temperature.